When a friend posted a link to a video on her Facebook page with the caption “Oh my. 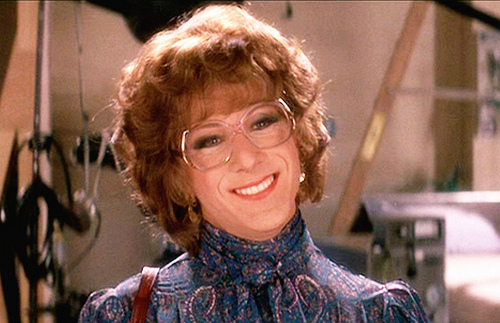 Dustin Hoffman breaks down describing why his famous roll in Tootsie was never a comedy. If you&apos;re a bloke, watch this. If you’re a woman, it will make you cry…” I rolled my eyes. As if Dustin Hoffman talking about dressing up in drag could squeeze a tear from me. Pfffft. I started watching the interview – from the American Film Institute files – thinking it was going to be a “boo-hoo, poor me, I wasn’t attractive in the movie” pity piece. And sure, Dustin started out discussing how upset he was by how unattractive he looked dressed and made-up as a woman. “I thought I should be beautiful,” he recalls. But then the make-up artist broke it to him: this is as pretty as we can make you. And that’s when the interview became something more, something amazing. And my friend was right. When Dustin started crying at the memory, so did I.
Here’s what he had to say that really made me choke up: "It was at that moment I had an epiphany, and I went home and started crying. Talking to my wife, I said I have to make this picture, and she said, &apos;Why?&apos; And I said, &apos;Because I think I am an interesting woman when I look at myself on screen. And I know that if I met myself at a party, I would never talk to that character because she doesn&apos;t fulfill physically the demands that we&apos;re brought up to think women have to have in order to ask them out. She says, &apos;What are you saying?&apos; And I said, &apos;There&apos;s too many interesting women I have…not had the experience to know in this life because I have been brainwashed. That [Tootsie] was never a comedy for me."